Tonight, I’ll be tuning in for To Walk Invisible — the BBC drama about the Bronte sisters that is featuring on PBS Masterpiece. If your passing knowledge of the Bronte sisters is simply that they were successful writers, then you’ve missed a huge swath of their story– the entire furtive, formative swath. The part that was hard, ugly, and, literally, doomed . . . but literarily resilient. But then, could you have expected anything else from a family that lived on the atmospheric Yorkshire Moors and created such stories as Wuthering Heights and Jane Eyre? I think you could not. It might be smart for me to watch tonight’s show and then write this post about the Brontes– both to refresh my memory about their story and to comment on the show itself. But I’m at the computer now, and so I write. Also– before the show has the opportunity to retouch my memory of a trip to the Bronte Parsonage at Haworth– I’d like to tell you what I remember about my trip there, because it had quite an impact on me. Confession: I was never a big Bronte fan. My sister was the impetus behind our trip to the Bronte’s home. I didn’t dislike the Brontes, I just hadn’t spent much time with them. I probably thought their brand of gothic fiction was more outdated than classic. I was wrong. But I didn’t see that until I visited their home and learned more about their lives. The conventions of gothic had nothing on the actual lives of the Bronte sisters. Dark, atmospheric tales weren’t just a hook for catching a reader, they were faithful incarnations of the harsh realities of life in Haworth (and at the Bronte home). Their mother and two sisters died young. Their brother died in young adulthood– of illness and addiction. Emily died four months after her brother; Anne died the next year; Charlotte died six years later (but still only 38 years old). Their father outlived them all, by many decades. He was quite the exception for the village of Haworth. In the 1800’s, the village was a gloomy place and the average life expectancy was less than 30 years old. There was no real sewage system in Haworth. Sewage often ran in the streets and tainted the water supply. What water there was to start with– which wasn’t much and was of bad quality. Finally– just to add some grim to the grime– the overcrowded city cemetery, which grew more overcrowded each year and had very bad drainage, sat (still sits) at the top of the city hill, further poisoning the town. That is a recipe for death by death. 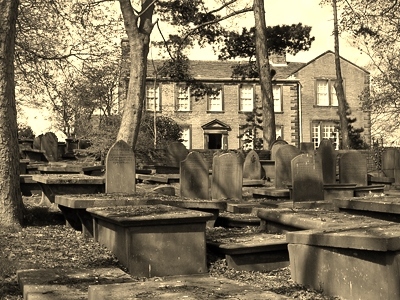 One more thing–possibly important if you are a Bronte– the village cemetery sits in front of the parsonage. Death on your doorstep: a fine thing to wake up to each morning. So, if you were a Bronte sister, you grew up in a village where infant mortality was sky high and people of every age had a tough go of it. You lived at the edge of the wild and harsh Moors, quite a distance from any large, urban centers. Your prospects in Haworth were not so very good, your childhood playground was a cemetery, the wind howled, your preacher father married and buried a revolving door of friends and neighbors, and nothing in life was easy, not even a kettle of water for your tea. No wonder your brother became an addict; no wonder your relatives passed young. No wonder your imagination turned to a rich inner world to pass your days . . . but a world of disquieting stories. I’m sure tonight’s program will teach me a good many things about the Bronte family that I did not know. I am eager to learn. My first visit to Haworth was around 2006– so my memory is a little fuzzy on details, but not on the overall impression. I’d already been living in Yorkshire for a year, and loved the environs, so it’s not surprising that what struck me most about the Bronte home was the town, the general environs in which this family lived. It was the perfect setting for a gothic tale. It was a grey, atmospheric day the first time I visited Haworth. The town was picturesque and compact. 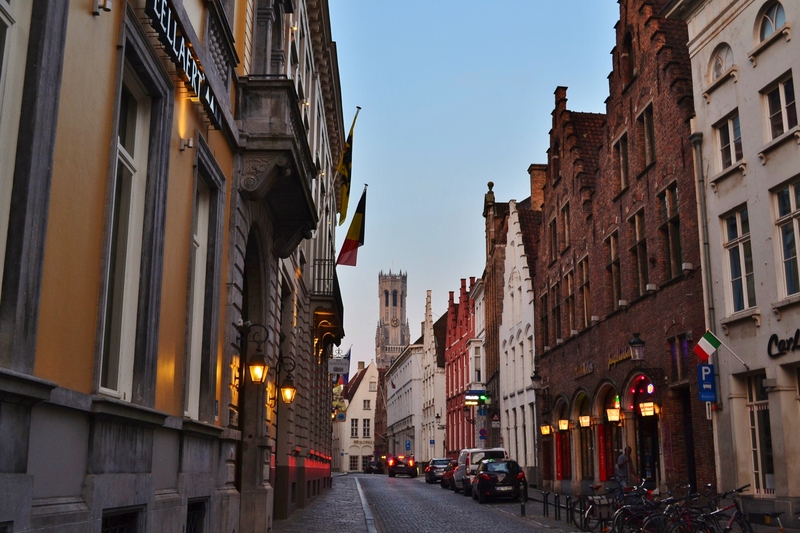 I remember winding up the cobbled street, passing a sweet shop, a tea room, a pub. Passing tourists. Seeing the tidy parsonage, and its dreary graveyard, at the top of the hill. All perfectly picturesque– especially as you stand at the crest of the hill and look down at the winding street of town, the stone shops and home fronts, and the rolling hills around it. BUT– for all of the beauty, as the grey clouds swarmed the day of my first visit and the air ran chill, I gathered up all I had learned about life in Haworth in the 1800’s, and what I remembered of some of the haunting elements of the Bronte sisters’ tales, and I saw the town differently. I saw the graveyard at the pinnacle of the town, I saw the run off and sewage coursing through the streets below, I saw Branwell (the addled addict of a brother) watching death wash over the streets from the dark pub window. The town itself seemed a little Jekyll and Hyde to me. Haworth seems like a tale well told, but hard-lived. An amazing place to visit, for certain. I’ll leave you with two things, below. 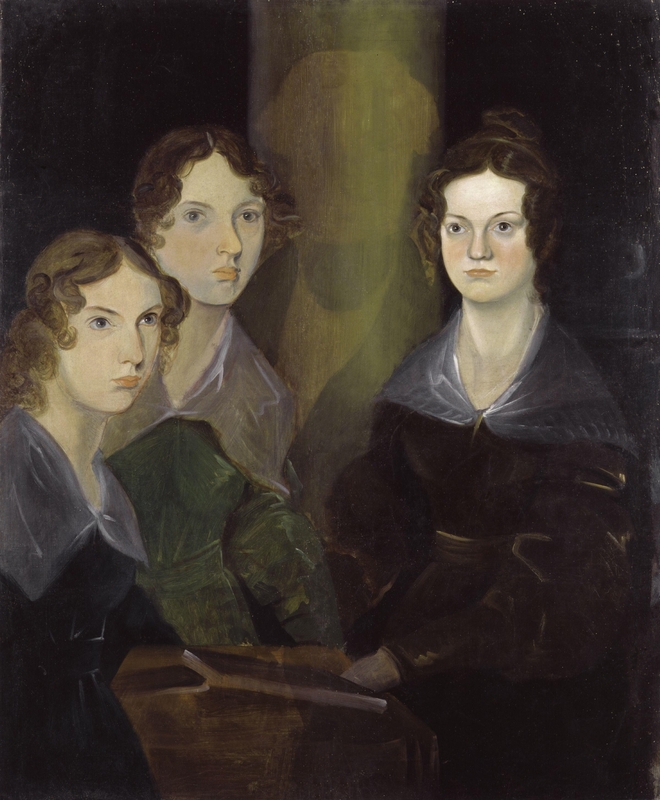 The first, a portrait that I saw in the parsonage– rather famous– which Branwell painted of the three sisters who survived him. I love (and loathe) it for the fact that Branwell had originally painted himself into the portrait, but (for what reason?) decided to erase himself out of it. It is no subtle erasure. What he leaves is worse than a gapping hole in the middle of the painting: it’s a spectral ghost of himself that (for me, at least) becomes almost more of a focal point than the remaining likenesses of his sisters! I suspect that this will in some ways ring true with the Bronte family story I watch tonight. The ghost of Branwell, the presence of death and despair in Haworth, is largely the energy that created the Bronte stories. The second nugget I leave for you is a YouTube video that acts as a teaser for the production To Walk Invisible. Enjoy!